Laser igniters could replace good ol' spark plugs | IAMABIKER - Everything Motorcycle! Now this is something that would bring about a lot of change in India ! >>Releasing of NOx gas defending on the air fuel ratio. 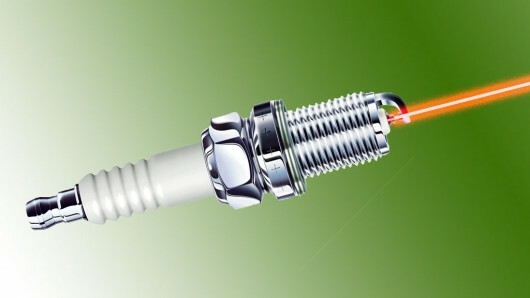 >>The Spark Plugs primarily ignites only the area that is closest to it, i.e the top. Engine timing could be improved, as lasers can pulse within nanoseconds, while spark plugs require milliseconds. With the short comings of the conventional plugs sorted out , expect a good increase in efficiency and also a massive drop in emissions! Made from two bonded yttrium-aluminum-gallium segments, the laser igniter is just 9 millimeters wide and 11 millimeters long. It has two beams, which can produce a faster, more uniform explosion than one by igniting the air-fuel column in two locations at once — the team is even looking at producing a laser with three beams. While it cannot cause combustion with just one pulse, it can do so using several 800-picosecond-long pulses. Lets hope we see this concept come live as soon as possible!